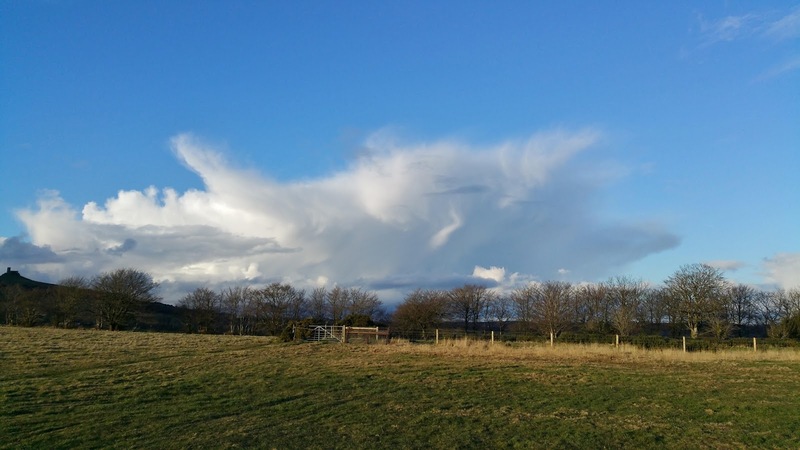 With a pair of warm fronts crossing the West Country there was no prospect of flying today. 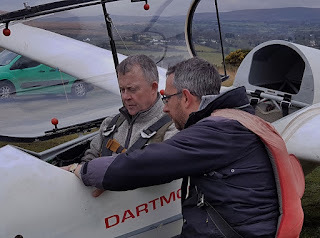 That did not, however, prevent DCFI Gordon Dennis, from making a most interesting presentation about his ideas for the flying programme in 2017 and how, with some agile thought and adaptation, the club might be able to make better use of its resources. These ideas will be presented to the committee at its meeting on 18 February, following which we hope to be able to produce a calendar for the entire year. 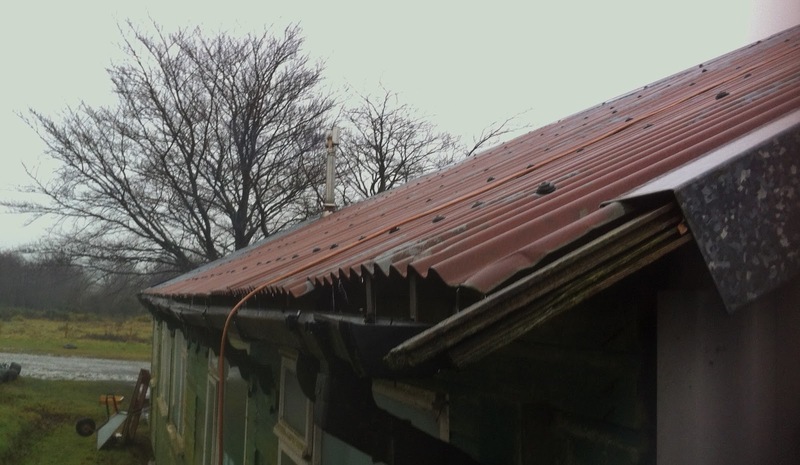 Spot the raindrops from the clubhouse roof. Today's forecast was for showers increasing in frequency. 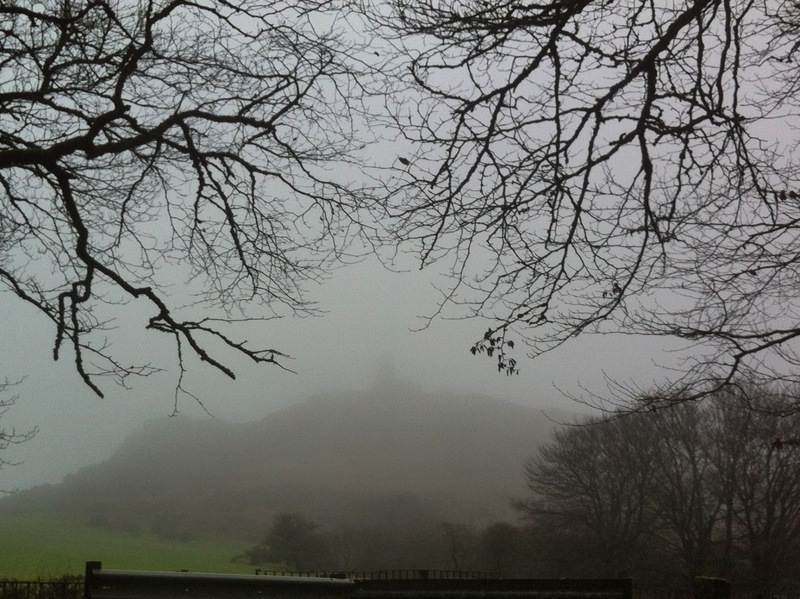 At Brentor this kind of forecast can be tricky. Sometimes the showers pass us by all day. Sometimes each and every shower pays us a visit giving almost continuous rain. So without visitors today we got out a K13 and K8 to fly until the conditions beat us. The first task of the day was to change ends. 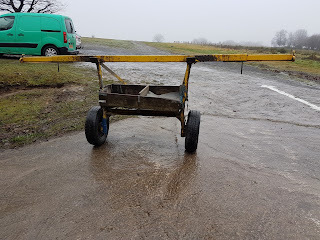 This lead to some intricate manoeuvring to turn the winch 180 degrees without getting it stuck on the wet runway surface; the overnight rain had left the runway relatively soft for a 7 ton winch.. The gliding equivalent of a "Push Me Pull You". 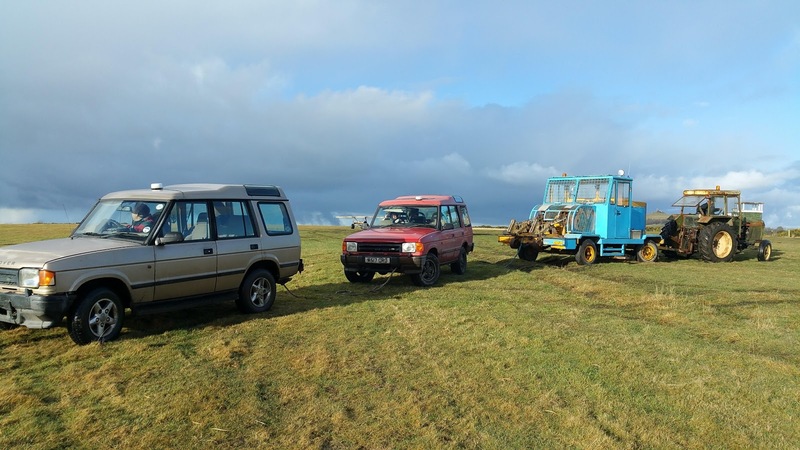 The tractor is providing forward movements and the landrovers reverse. Meanwhile, in the hangar, Rick was to be found with his legs sticking out from under the original ML winch. He and his crew were changing the seal on the fluid flywheel which had been leaking. By the end of the day the task was complete and the winch had been tested and was launching gliders. 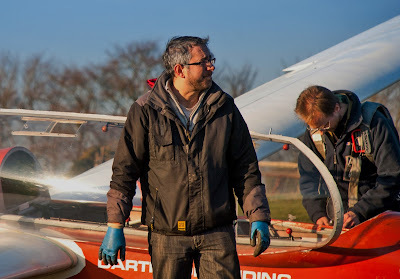 Mike clears water from the wings as the pilots sit in the warm. 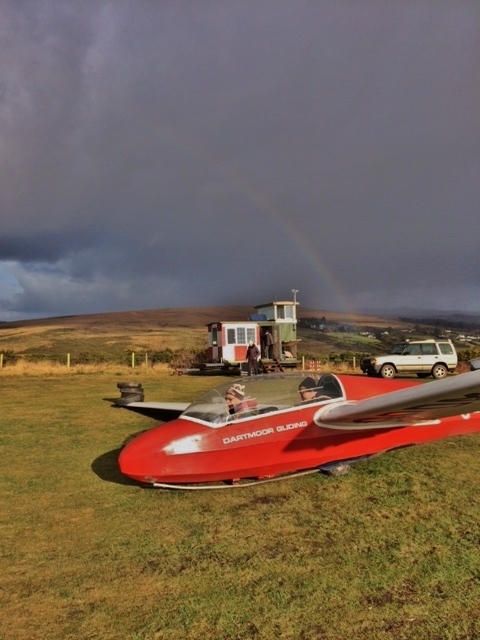 Flying today required patience as the showers came through but we made the best of it. Lots of practice cable breaks when low clouds passed over and circuits to preserve flying currency. The view from the K8 in circuit towards the end of the day. After the early morning front had passed through (see photo), and with no visitors scheduled, there was every prospect of today becoming a pleasant south-easterly day – and so it turned out. With recently qualified instructor Peter Howarth at the helm, we had proceedings underway by 10:00, and with Paula Howarth, Leith Whittington, Colin Boyd and Rich Roberts taking up the 'Dress Circle' in the single seaters, whilst Dave Downton, Dave Westcott, Ed Borlase and Ben Caverhill mucked in with the two-seaters the 'stalls', we managed a full day's flying, with 29 launches overall. As soon as an early morning trough had passed through, we were ready to go. Dave Downton and Joe Nobbs provided entertainment for all with simulated launch failures, whilst Joe also won the accolade of Flight of the Day in the K-13 by bumping into a mildly buoyant thermal just south of the winch for a full 12 minutes – thus causing third degree burns (thankfully not permanent) to his wallet! Joe Nobbs brings K-13 DMX into land after a successful simulated launch failure. Ben Caverhill practices use of the trim lever after changing speed. Glider Pilots do it... in hats! As the sun dipped behind a cloud bank at about 4:30pm the temperature plummeted and it was time to get the gliders back to the (relative) warmth of their hangar. Rich Roberts looks for ways to improve the launch rate whilst Joe Nobbs mounts up. Thanks go to Rich Roberts and Dave Downton for driving the winch, and all those who ran the retrieve and launchpoint: a lean, mean team who consistently delivered just over 5 launches per hour throughout. 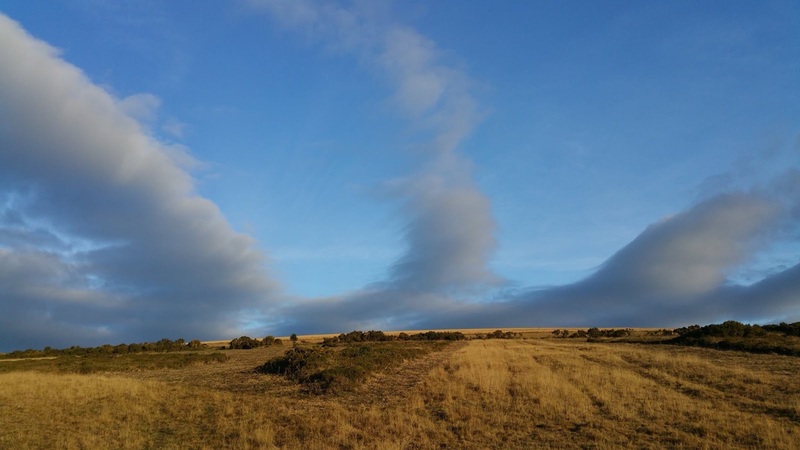 With high pressure sitting over the UK and a general easterly airflow we have been teased for several days with the sight of wave clouds and lenticulars sitting over Dartmoor. Waking up on Saturday morning the high hopes of an active wave day were dashed. The wind was very light from the SE with a solid looking low dark grey cloud cover. Arriving at the airfield, hopes were raised a little as there was an area of sky over the site with only a little cloud cover. Visibilty away from the airfield was poor and was destined to remain like this for most of the day. 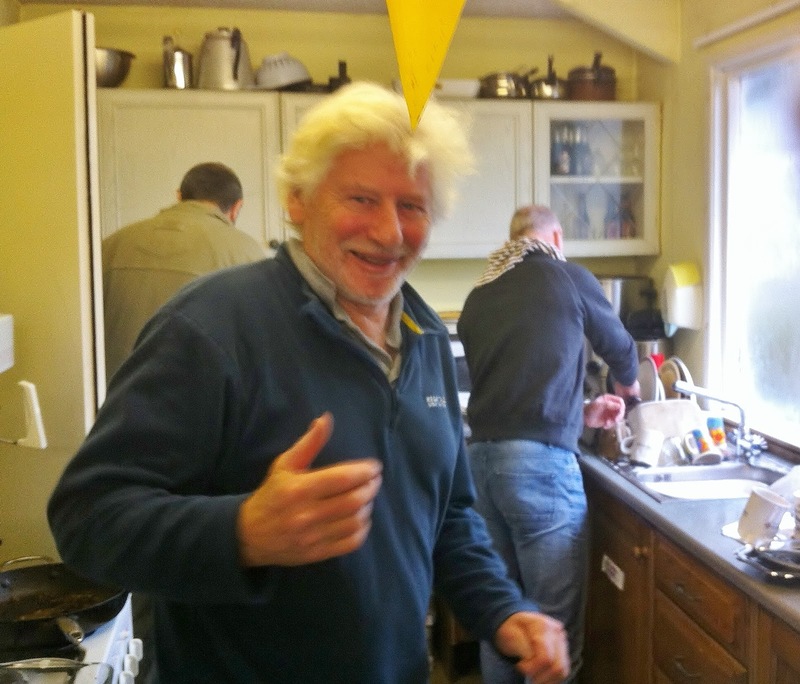 We welcomed the return of Richard Jones our cancelled One Day Course from last Saturday. He and Mike Jardine made sure that his course was flown today. 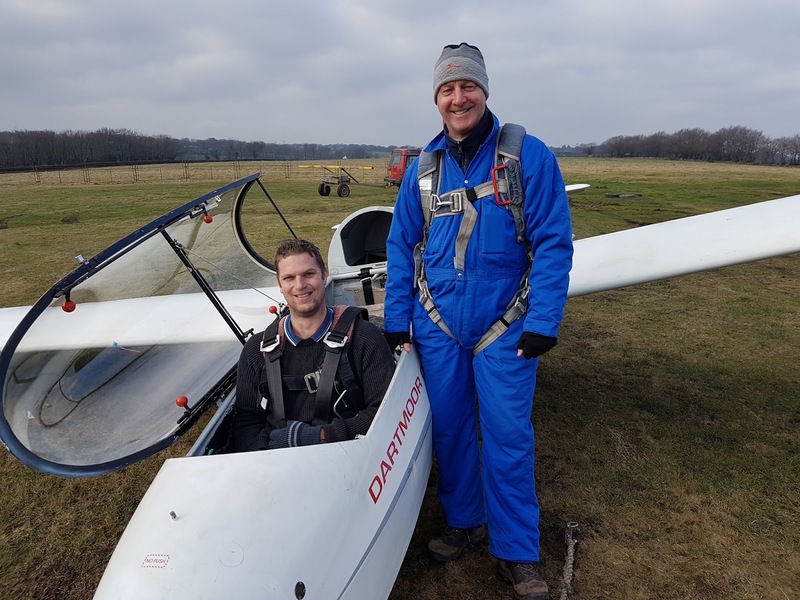 It looks likely that Richard will continue training to become a glider pilot. 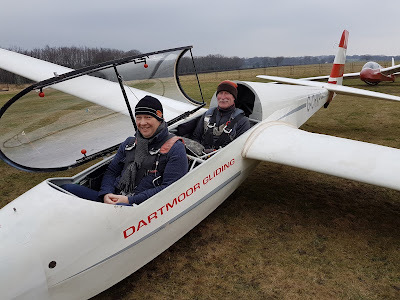 Club member Steve Raine recently qualified as an Introductory Flight Pilot and today he flew his inaugural flights with visitor Simon Aikinson. They both seemed to enjoy their themselves. What of the conditions? The wind was just too light to give any real wave effects although there was an area of reduced sink to the south of the airfield. This was exploited by the solo pilots in their efforts for flight of the day. Today the honours were shared by Colin Boyd, Ged Nevisky, Allan Holland and myself, all of us managing to keep the K8 airborne for 8 minutes. Fans of "Toy Story" and "Buzz Lightyear" would say that this wasn't soaring it was more like "falling with style". 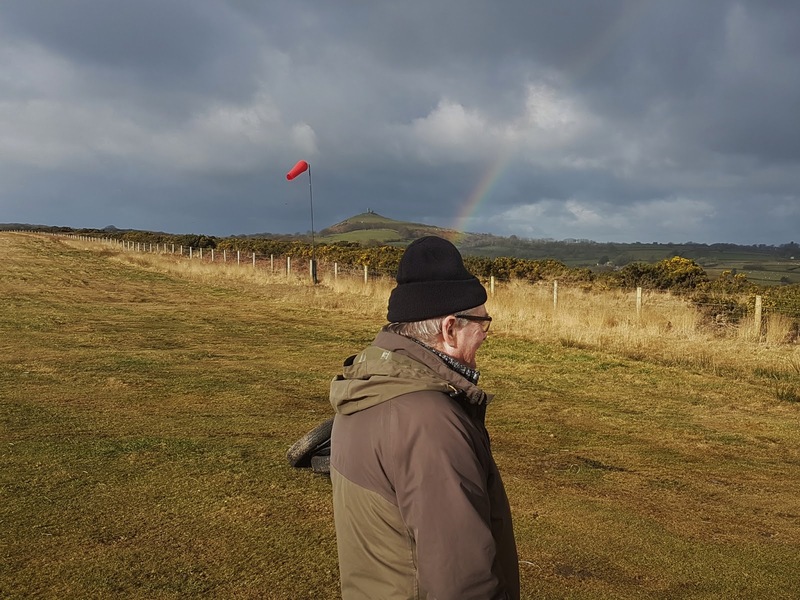 A good day in the cold conditions of a Dartmoor winter. 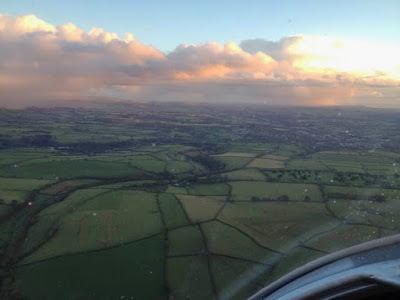 The forecast was for widespread cloud, from 800ft amsl, rising gradually. 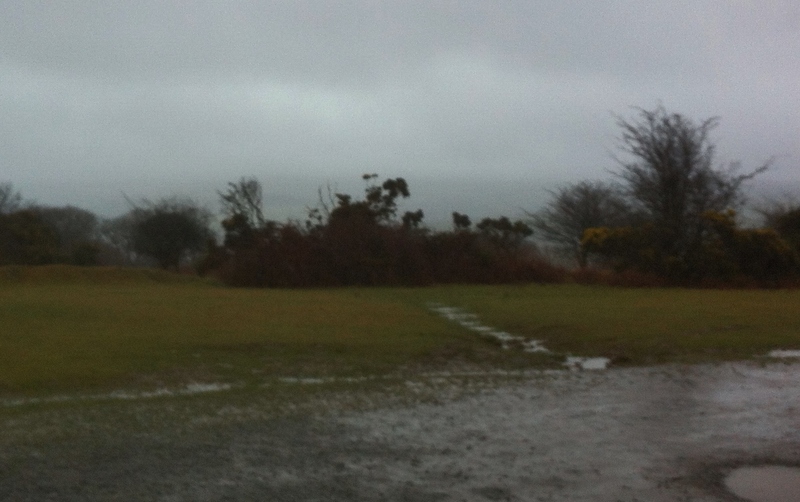 So on arrival at the club it was just a case of waiting for the aberrant wet stuff to stop and all would be well. Except the aberrant, unforecast and unwelcome wet stuff didn’t stop; it persisted - all day! Can you solve the ‘mis-tery’of the church? IF you CAN spot it, you don’t need to go to Specsavers..! 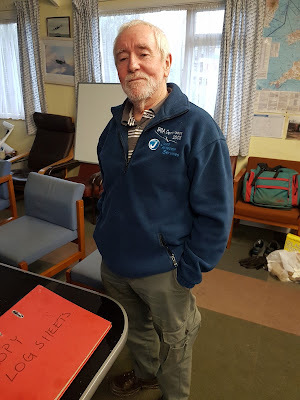 Also bidding us ‘adieu’ was Adrian Irwin who, having flown yesterday, was hoping to get a couple of launches in prior to departing to South Africa for the month of February. Sadly the weather put paid to that but we wish him all the best for a safe and great adventure: haste ye back, Adrian! 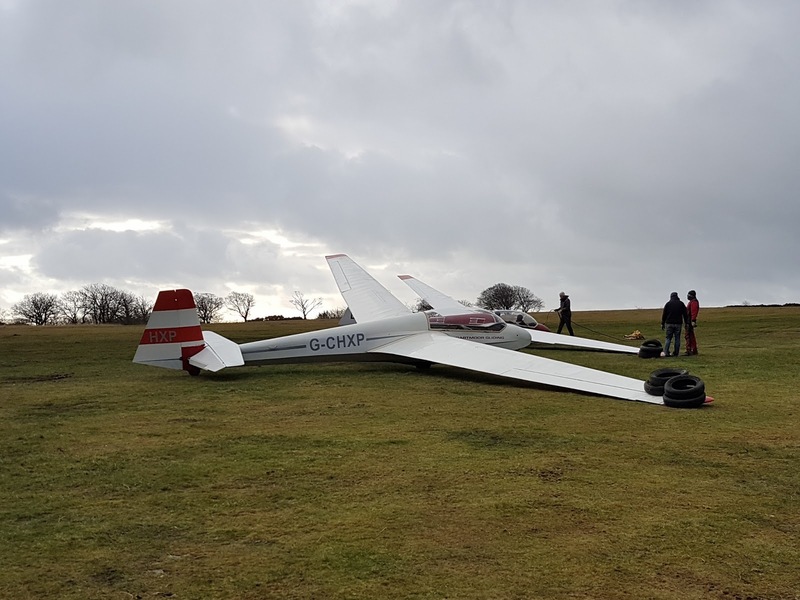 Was today going to be flyable? After perusing all the available forecasts, ( and his favorite piece of seaweed ), CFI Don Puttock thought so, but with care. So the K8 was left firmly in the hangar while the K13's were taken to the launchpoint to do battle with the gusty NW winds. The K13's wating to go. 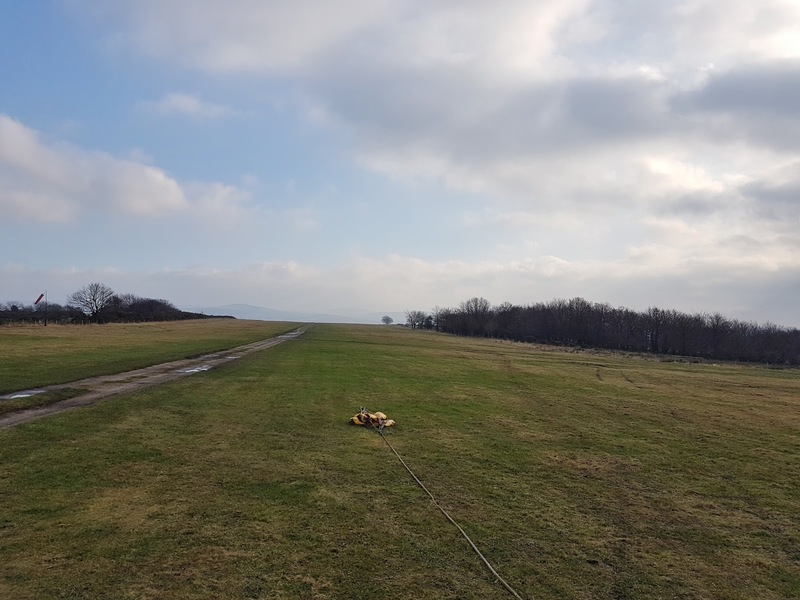 In the air, the gusty conditions precluded any chance of soaring but the pilots enjoyed the chance to practice their handling skills, many choosing to land on the stub runway, a 300 meter SE-NW extension on the SE corner of the airfield. On the ground the challenges were to ensure the the gliders were handled safely and properly secured in windy conditions, to keep warm despite the wind, and to maintain good humour when the shrill gust alarm was sounding every few minutes. Several showers passed close to the airfield but missed us in the most part, but providing some great rainbows. 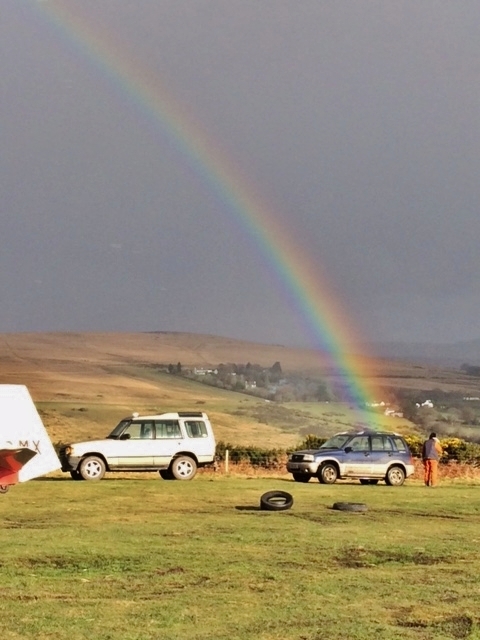 What do you find at the end of a rainbow? 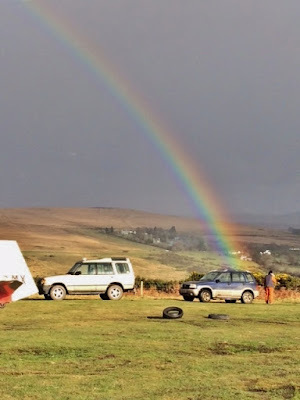 A pot of gold? Leprecaun? 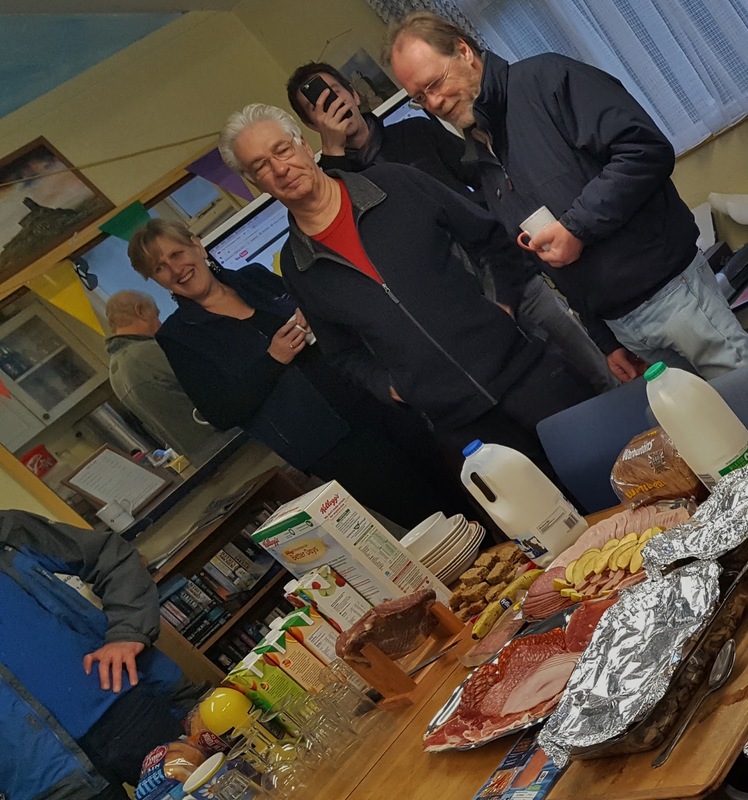 It was 9am, the weather outside was dank and miserable, and so there was nothing else for it but for Paula Howarth to declare the DGS 2017 Post Brexit Breakfast OPEN! 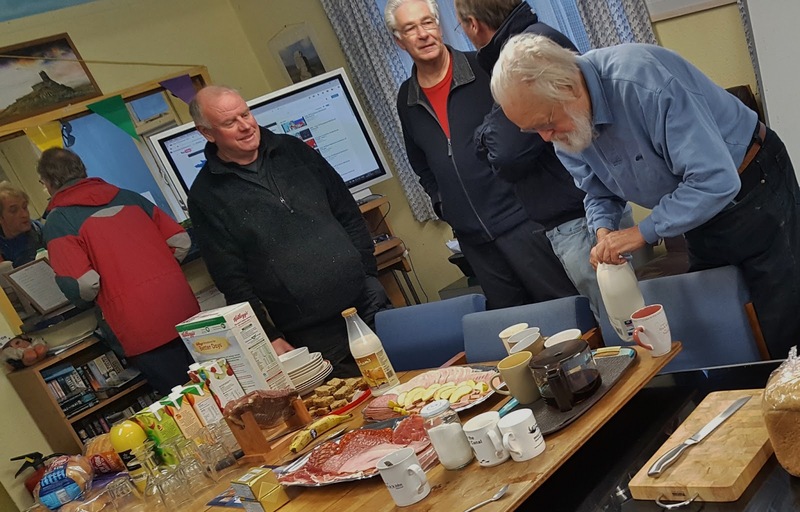 With more than twenty-five members in attendance there was ample for all, and very few leftovers (just enough for Roger's massive dogs), which generated plenty of dirty plates for dishwasher 'Scratch' to wash.
Jeff Cragg helps himself to a welcome pick-me-up at the Brexit breakfast. As the feeding frenzy died down the conversation turned to hopes, wishes and desires (of a gliding nature) for the coming year, and hence there was much talk of expeds, competitions, courses and general objectives for 2017, with pilots making arrangements to participate in the Inter Club League (ICL – contact Rich Roberts if you wish to join in) to meet up at the Long Mynd, Denbigh and possibly even Talgarth (for aerotow training) at various points in the year. the clubhouse table groans under the weight of breakfast fayre. So not just a beltstretching exercise in calorie counting, but a useful opportunity to meet, compare notes and set sights above and beyond that which was achieved in 2016. Colin Boyd gives an encouraging thumbs to ‘Scratch’ Hitchens as he washes the dishes. Next event is the club End/Beginning of Season Social which will be taking place at the end of February. Watch this Space! 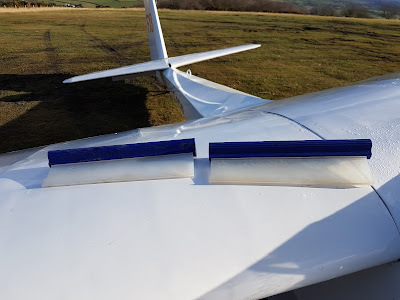 What colour represents gliding today. Is it the white of the latest "hotship" flying cross country at warp speed? Or the bright colours of gaily painted vintage gliders frolicking in the sky against a background of white cumulus clouds put there by the thermals they seek? Or, maybe, the seemingly endless shades of green when looking down at the patchwork of fields which make up most of the countryside we fly over regularly? 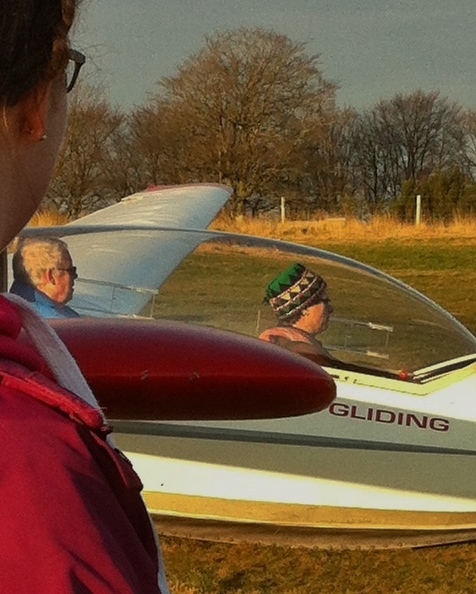 Well, unfortunately, today the colour of gliding was definitely grey. 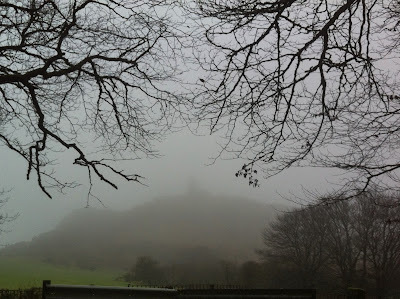 No, not the grey of the older pilots hair, but the grey of fog and low cloud. 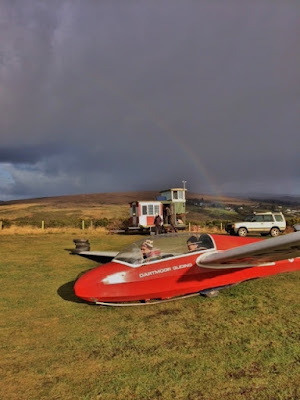 Cloudbase today was about 600 feet above sea level which is a problem when the runway is 820 feet above sea level. 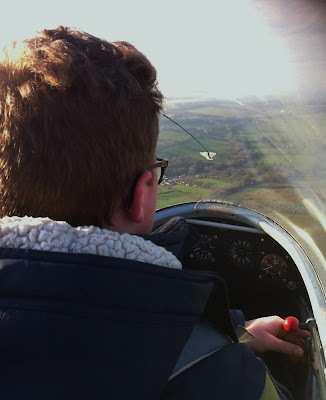 So, right from the start, today was a non flying day. Was the day wasted though? Not a bit. In the hangar, Rick and Scratch repaired the cable tow out trailer by welding back on the broken wheel and stub axle assembly after which they spent their day working on the 2nd Quad bike which has had a complete rear end rebuild. By the end of the day this machine is once again ready for action. 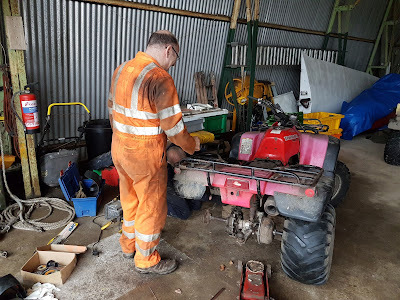 Rick working on the Quad bike. 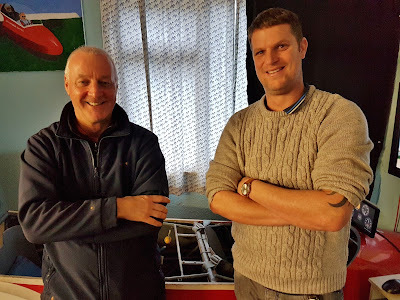 In the workshop, Colin and Dave advanced the work on the BVB wing which is now ready for approval by a Senior Inspector before work starts on the second wing. In the clubhouse, it was very pleasing to see that Ged has made a return to the airfield after his operation. While not yet ready to fly, Ged's visit marks a big step forward for him and he is looking forward to flying in the spring. Also in the clubhouse, Mike Jardine spent a large part of the day with Richard Jones, today's One Day Course, who will be returning next week if the weather permits. 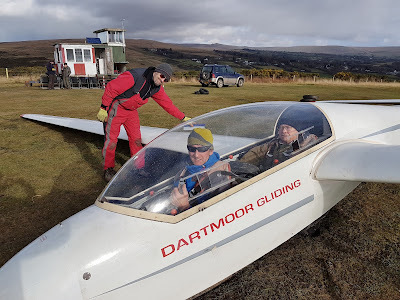 They spent a lot of time in the simulator exploring the differences between gliders and the powered aircraft Richard has previously flown. 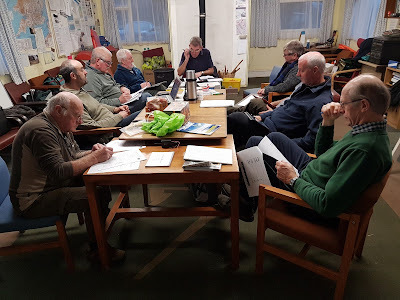 The afternoon was rounded off by the regular monthly Committee Meeting which stretched well into the evening. we were able to get away with an early morning, as opposed to a lunchtime, start. With Rick Wiles running the field as probationary Duty Instructor, and next to no visitors to fly, today was the ideal opportunity for him to attune his knowledge to the variety of skills held within the club. The light wind (southerly at height) also gave us an ideal opportunity for students to practice their emergency reactions to launch failures, at a variety of heights. 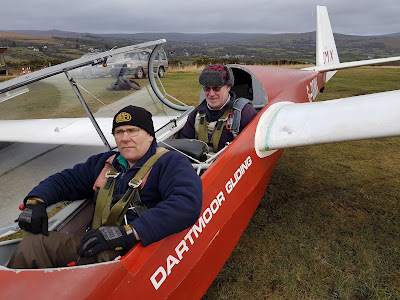 There were three visitors today, all club related (today being an ideal opportunity for members to get their friends and relations into the air via the F&F scheme). 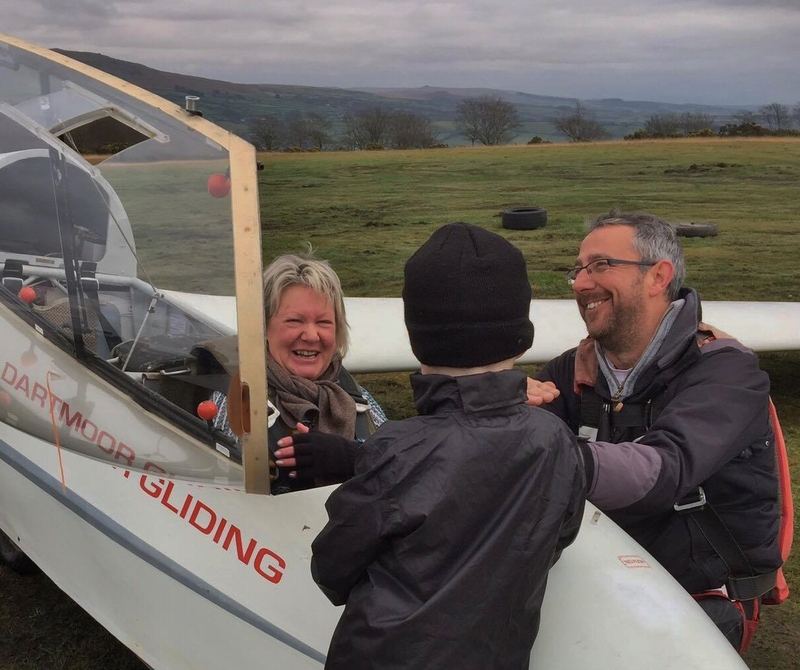 First, Rich Roberts flew with dad Terry, a former member, and then, having been 'signed off' by dad, flew with the parents of Fixed Price to Solo member, Callum Doyle (parents being Denise and Tony, with grandson Junior, as pictured). The air was significantly drier than a couple of weeks ago and thus, from a 1030 start, we managed to keep going until beyond 1545, when moist air driving in layers of cloud from the south coast (600ft and 800ft agl) caused us, with the 27th launch going to 'Scratch' Hitchens and all-round helper Dave Bourchier, to put discretion before valour. That is not to say the the day was entirely incident free. 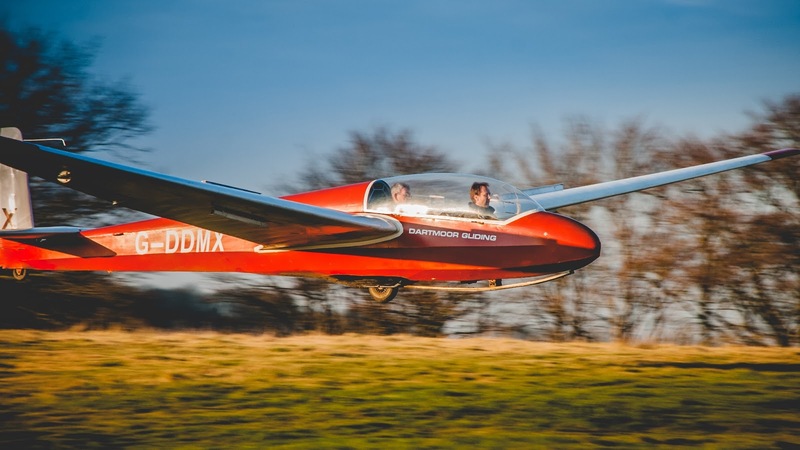 As has been commented on before, there are occurrences at gliding sites that some people positively revel in, which they would not be the case if they took place on the driveway at home. 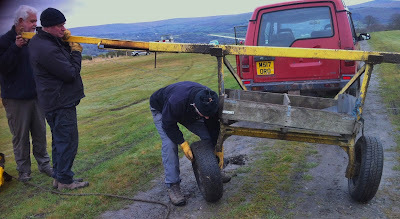 Today's was the catastrophic departure of one wheel of the tow-out trailer from its supporting structure, not far from its destination at the launchpoint during a retrieve. Many hands made light work and we seamlessly moved to a two vehicle retrieve of both cables for the rest of the day – however there will be some heavy welding required to get the trailer back onto both wheels before the first weekend's flying of 2017. It’s got plenty of tread left, it’s just the tracking that’s a bit iffy..! All the best to Everyone for Safe and Enjoyable Flying in 2017!